This youtube features David Crosby. Crosby, the first name in the awesome band Crosby, Stills, Nash and later on, Young. He may not have had the same success solo as did Neil Young, but it was his solo stuff and material with Graham Nash that I always was most fascinated by. His voice and his open tuning guitar wer a perfect combination. David Crosby was a former member of the Byrds, think ‘Turn, Turn, Turn’ and ‘Hey Mr Tambourine Man’ , he band also included Gene Clark and Roger McGuinn. The harmonies of the Byrds and later on CSN set the standard for other bands, who could forget their version of Woodstock and Wooden Ships. It would be correct to say I love this guys musicality and if you aren’t aware of his solo material check him out. Note: David Crosby and his buddies would often use open tunied guitars. I’ll continue to post articles, guitar hints, approaces to glearning guitar, TAB, guitar notation and youtubes on a regular basis. 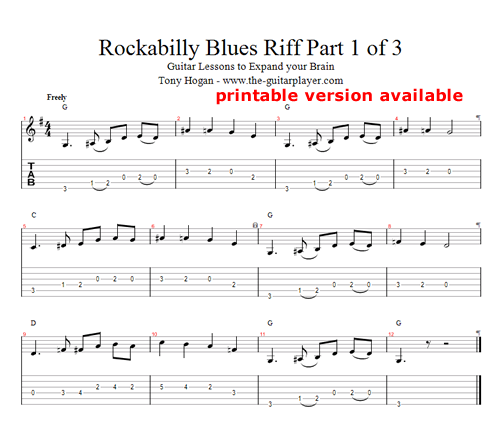 The Rockabilly Blues that I have written the Guitar Tab and Music Notation for is the first of a series of three. Once you get this one worked out play it fast but make sure it is in time. It will roll off your fingers in no time. It’s important as a guitar player to be able to play lots of variations of simple riffs over common chord patterns. By doing this it wil help you become a strong improviser and after some time it will be easy to go from guitar accompaniment directly into a solo in a seamless manner. Often as a guitar player you’ll find yourself in a situation where thee are a number of guitar players playing at once. Someone is always going to go for the straight rhythm guitar and sure enough, a few others will want to solo over the top of everything. So the ability to be able to play melodic parts to accompany a piece of music is very useful and a lot of other players often won’t even consider doing it. Parts two and three will be a little more complex. I will upload these within the next couple of days, come back and give them a try. The Guitar Player site is now back up and running after some unscheduled maintenance. Just a message about my other guitar player blog at the-guitarplayer.com is currently down and may be so for 24 hours. James Taylor playing Fire and Rain, his flawless fingerpicking on an Olsen guitar is a reminder how a well written song can stand up over time. This acoustic guitar recording is about ten years old now. Gone is the hair, and the face is a little older but the silky tenor voice still has a gorgeous texture. The second version is closer to original recording time. It’s a wonderful trip down memory lane. I’ve posted two versions on my guitar blog site so you can make a comparison. It’s a reminder to us all how music is not necessarily something that we do for a little while, once we can play it can be with us our whole life. The need for us all to express emotions is an essential part of living a healthy emotional life. Acoustic Twelve Bar Blues in A is a simple guitar lesson I wrote tonight. It’s called the Daily Lama Blues, please excuse my play on words, it just seemed topical. It’s a basic twelve bar chord pattern that you could play with a pick or fingerstyle. Yesterday I posted about a Keith Richard (from the Rolling Stones) acoustic blues and it inspired me to write a Blues Guitar tune that could easily be built upon and turned into a piece of music that would easily stand up as a tune in any blues repertoire. Like everything I do on my sites, it is copyrighted by default. This blues should be played at a slow pace. You could use a straight sort of A minor Blues scale but if you want something more interesting, have a look through this guitar blog site or my other one at the-guitarplayer.com and you’ll find things that will get you out of those boring old patterns.